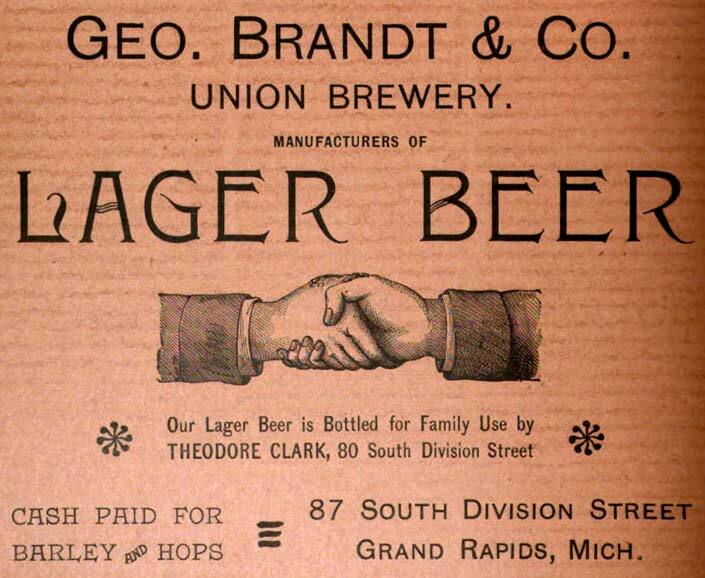 Brewery advertisements in Grand Rapids from the time can tell a lot about the history of beer generally, but also specifically what was happening with the West Michigan breweries, as beer styles and trends that were popular, were advertised. 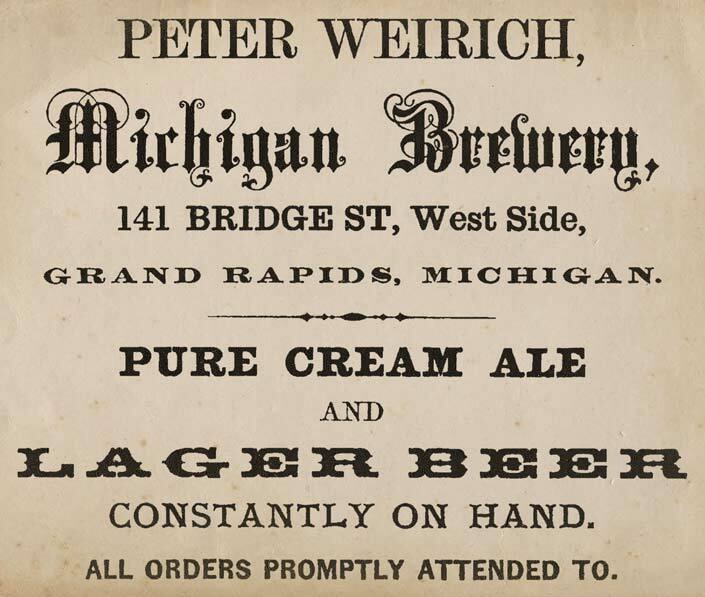 Of the first indigenous American styles; the American lager, the cream ale (also know as common or present use) and the steam beer, lagers and cream ales were already becoming popular in the 1850's. 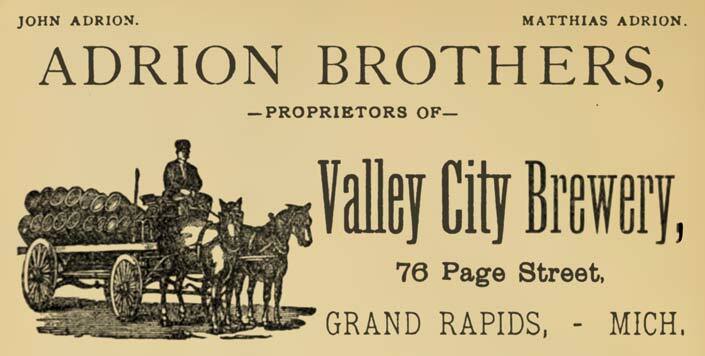 Williams' Grand Rapids Directory, City Guide, and Business Mirror 1859-60, published by P. G. Hodenpyl. 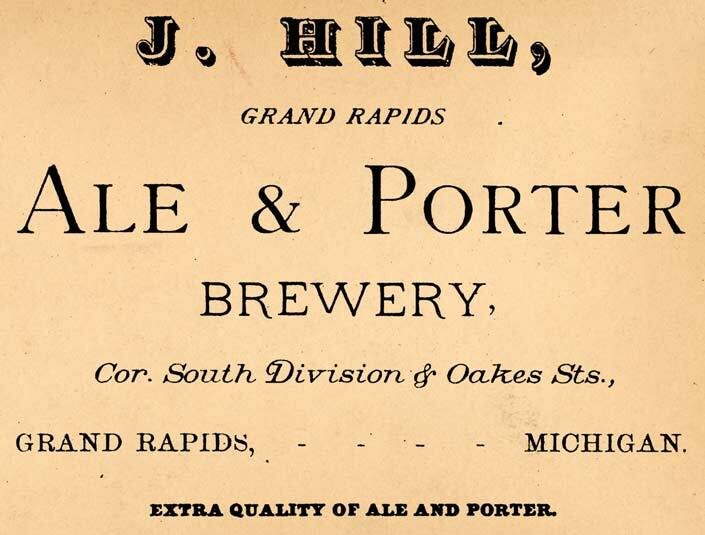 This continued into the 1860's, as lagers, cream ales and heavier ales, like the porter, were the most popular. 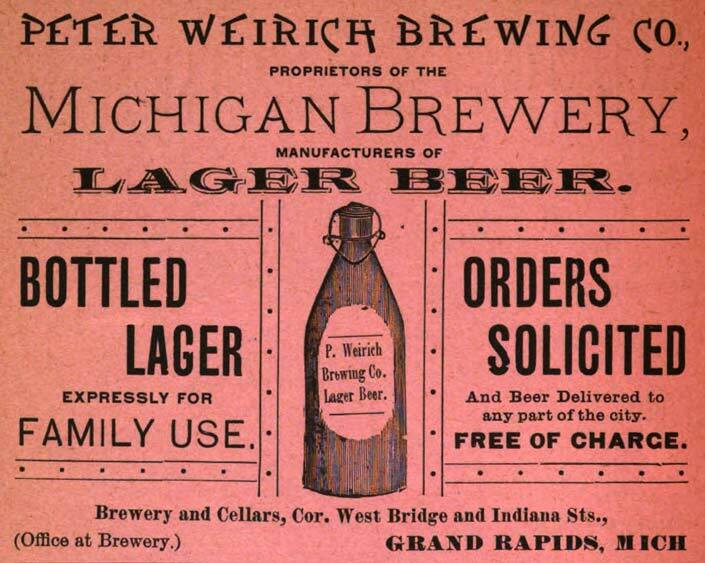 By the late 1870's, lager beers took over, although some smaller and English-style breweries stubbornly hung on the producing of ales. 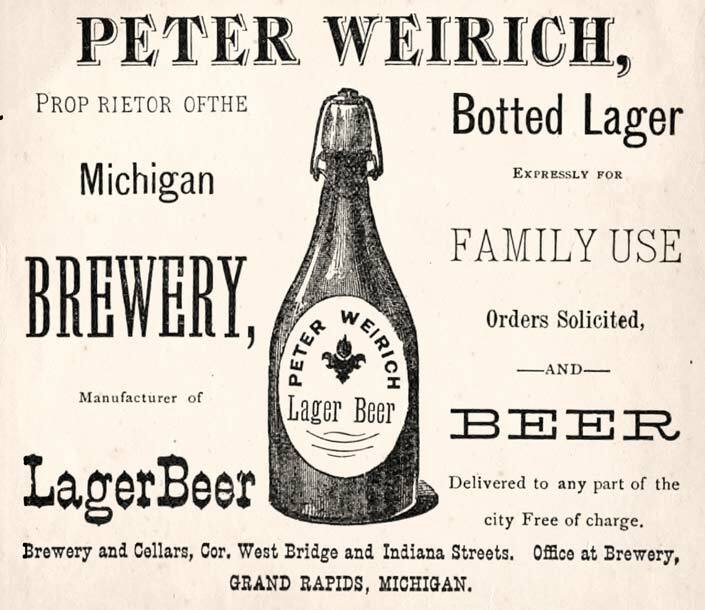 Although during this time bottled beers were being introduced, most of the breweries' production was still by wooden keg. 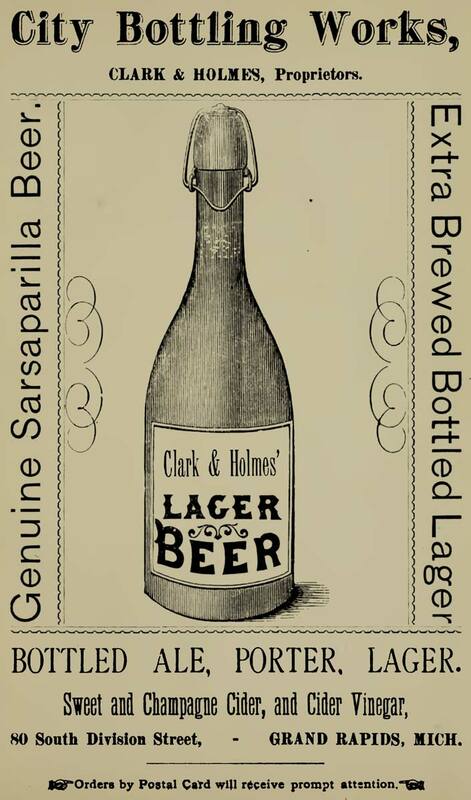 Bottling was done with heavy, stoneware bottles that had cork and wire-secured stoppers. 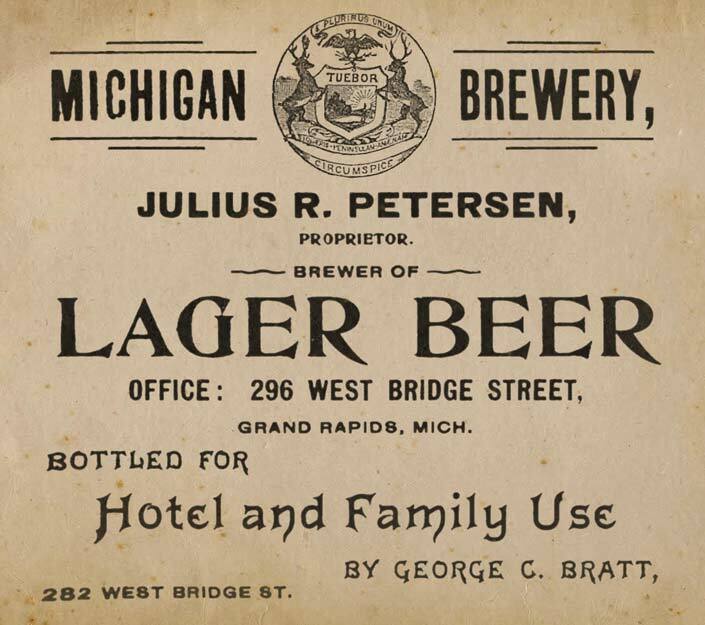 The 1880's saw major advancements in brewing beer including manufacture, pasteurization, refrigeration, bottling and distribution (as more railroads interconnected West Michigan). Bottling changed from stoneware to lighter glass; first hand-blown glass, and then later, glass bottles made from forms by machines. Bottle stoppers improved also; first lightening-style stoppers and later crown caps. 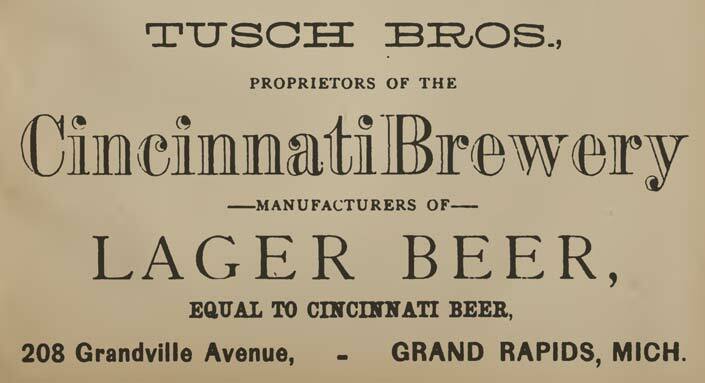 By the 1890's, lager beers were king, and small breweries went out of business or consolidated with others. 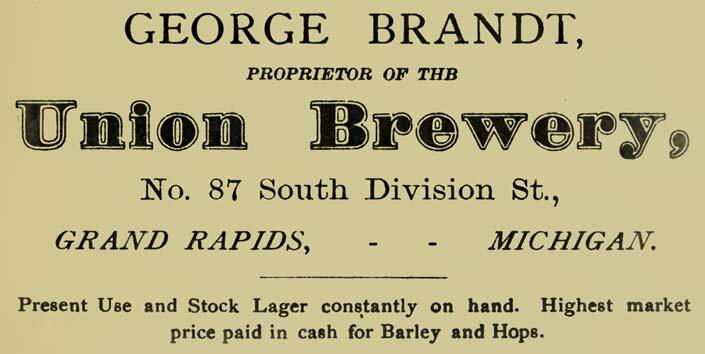 Grand Rapids City Directory for 1865-66, published by French and Ryan. 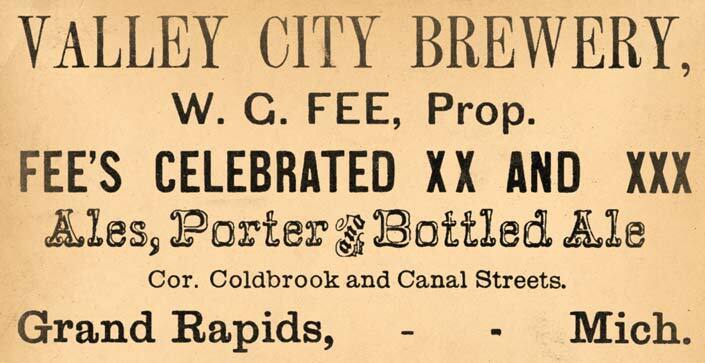 Directory for 1868-69 of the City of Grand Rapids, published by Dudley & Goldsmith. Grand Rapids Directory 1873-74, published by Burch, Polk & Co.
Grand Rapids Directory 1874-75, published by Polk, Murphy & Co.
Grand Rapids City Directory 1875-76, published by Murphy & Co.
Grand Rapids City and Kent County Directory 1876-77, published by Murphy & Co.
Grand Rapids Directory 1879-80, published by R. L. Polk & Co.
Grand Rapids Directory 1880-81, published by R. L. Polk & Co.
Grand Rapids Directory 1883-84, published by R. L. Polk & Co.
Grand Rapids City Directory 1889, published by R. L. Polk & Co.
Grand Rapids Directory 1891, published by R. L. Polk & Co.
Grand Rapids Directory 1895, published by R. L. Polk & Co.
Grand Rapids City and Kent County Directory 1898, published by R. L. Polk & Co.
Of the three breweries in Big Rapids, none malted their own barley. 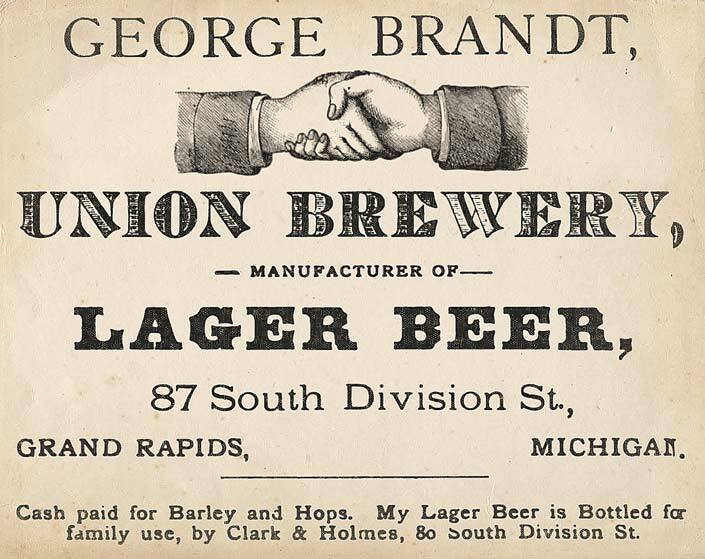 This is based on the Sanborn maps not showing any malting kilns, the fact that the brewers were most likely not skilled enough to do it, but also the fact that buying malted barley from a malster in Grand Rapids made the most practical sense for a small pioneer brewer. Each of the brewers had either direct access or indirect access to maltsters and suppliers for their malt. 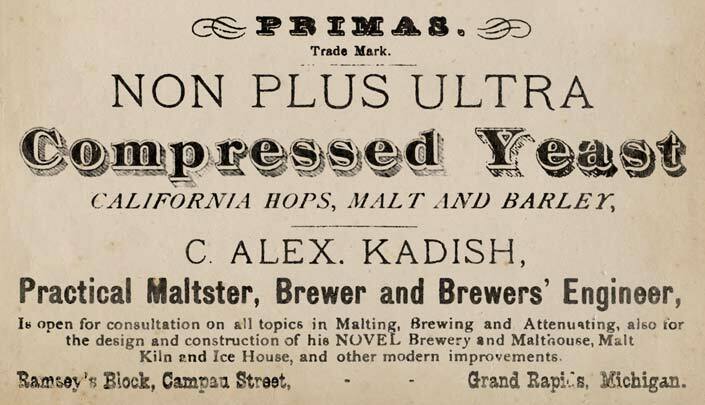 During this time, hops was not grown in enough quantities to supply brewers. Growers in Wisconsin, California and New York were the main suppliers. 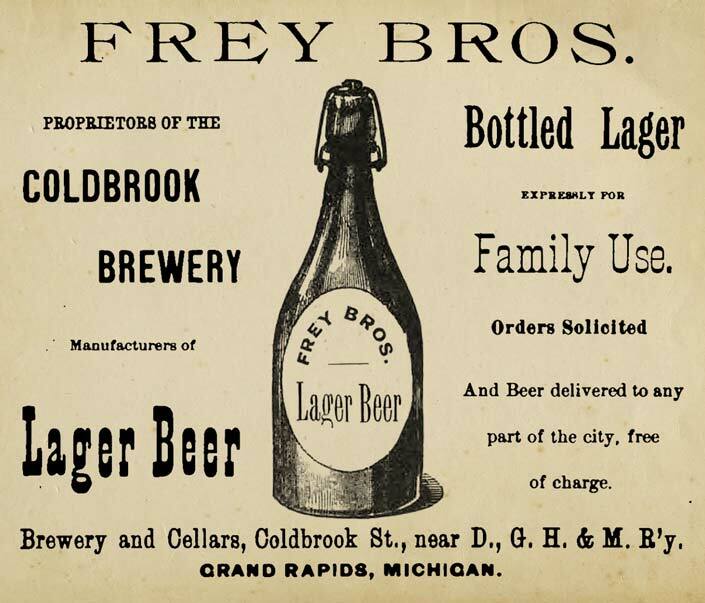 Erikson & Hoehn was likely the only brewery in Big Rapids that sold bottled beer and likely done by a local bottling works like Joseph Lentz, and was most likely not done until the late 1880's at the very earliest. Written by Marc Hansen. ©2018 Marc Hansen. Last updated, December, 2018.